Recently there have been a number of news items about George W. Bush's Arab bodyguard being thrown off a plane. They mostly focus on the question of whether racial profiling of Arab gunmen is appropriate. Briefly, Walied Shater, Wallid Shatter, or for all I know, Waleed Shatar (Arab spelling is hard to agree on, Libya's head of state has at least 32 ways of spelling Muammar Qaddaffi) attempted to board American Airlines flight 363 on Christmas Eve. He presented a form saying that he was an armed federal agent, going to see the President, and thus entitled to be armed on the plane. 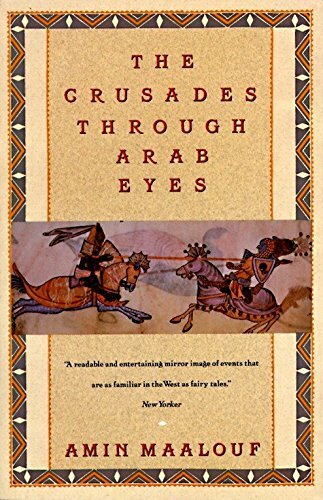 The pilot-in-command decided to not let him on the plane because he wasn't sure if he was a legitimate member of the Secret Service, and had other concerns, such as the book the man was carrying (The Crusades Through Arab Eyes, By Amin Malouf). Shater is suing American Airlines for not letting him on the plane, saying he was rejected on the basis that he's an Arab. This is unfair to American Airlines, which not only lost two planes to Arabs in the attack, but which actually issued a statement saying, "Let's not be beastly to the Arabs" on September 12th. "My fear is that it will be all too easy to direct our collective grief, anger and shock in ways that treat our Arab, Muslim and other Middle Eastern employees and customers with less than the absolute courtesy and respect that they deserve, because of stereotypes that we know in our heads and hearts are just not true," [AA CEO Don] Carty said in a recorded hot line message to airline workers. "We simply cannot do that. Muslims and Arabs are our co-workers and our customers—and they grieve over this tragedy as well." My question is one that no one seems to have asked: Why does W. have an Arab bodyguard anyway? Since Clancy always has happy endings, Rahman fails, but in the meantime, readers throughout the English-speaking world were jumping up and down and yelling "You've got an Iranian guarding the President! Are you crazy?" Clancy's book sold millions of copies. Did no one in the Secret Service read it? Have they never heard of "sleeper agents?" How about "jihad?" For ten points, how about "martyrdom?" "So let's stipulate that racial profiling was going on here. Let's also stipulate the obvious point that the pilot was wrong about Shater being a threat." No, let's not stipulate it. Anwar Sadat was assassinated by his own troops (Bin Laden and friends have been linked to that incident). But Sadat didn't have any choice about being guarded by Arabs. Indira Gandhi was assassinated by her Sikh bodyguard. She did have a choice about being guarded by Sikhs, rather than Hindus, at a time when her troops were engaged in clearing Sikh terrorists out of the Sikh temple. In bullet-riddled retrospect, her choice was wrong. "I talked to the man this morning," Bush said. "I told him how proud I was that he was by my side. He's here on the ranch, and he's guarding me. And of course, I was [upset]." "There's an inquiry going on as to specifically what took place," Bush said. But if he was treated that way because of his ethnicity, that's — that will make me madder than heck." What makes me [upset] – even madder than heck – is that Bush, who is involved in a War on Arab Terrorism, is so politically correct that he apparently sees nothing wrong with being guarded by a man who may decide, on principle, to kill him. I have no objection to Arab gunmen in principle - no vulgar universal "anti-Arab-gunman bigotry." I can't honestly say that "Some of my best friends are Arab gunmen." But I am a big fan of Massad Ayoob, a third-generation New Hampshireman, who runs a private firearms training school near Concord, N. H. I have several of his books, and I would trust him with my life. But I wouldn't expect the Secret Service to trust Massad with the President's life. I don't think he would either. When FDR interned and relocated Japanese and Japanese-Americans in WWII, he was responding to the massive sneak attack on Pearl Harbor. He was basing his decision on the well-known fact that blood is thicker than water, and that people frequently put loyalty to family and religion over loyalty to the state. When Osama bin Laden blew up the Twin Towers, we can be sure that he wouldn't have let John Walker Lindh stand behind him with a pistol, in case Lindh had a sudden flash of loyalty. Bush – and the American governing class – should wake up and smell the cordite.